You are at:Home»Featured»What Are We Complaining About? Tired of all the political advertisements? I can profess some sympathy, yet I think we had better stand up, look around, and thank God for them. I mean, what are the alternatives? Would we rather live in a country where they don’t bother with elections? That seems to me to be the only realistic alternative. Through most of human history, people didn’t have to put up with political advertising because they didn’t get to vote in elections: they were ruled – with more or less selfishness, cruelty, or indifference – by tyrants, despots, aristocracies, and oligarchies, by one name or another. By the very designations we give to them, we know that those kinds of rulers did not get and keep power over the people because the people elected them. Or, if they did get power that way, that’s not the way they kept it. But we are tired of the continual bombardment on television and radio. Again, what are the alternatives? Government restriction of speech – not least, political speech – was one of the great fears of the founders of our country: that’s why the freedom of the press and freedom of speech were enshrined in Bills of Rights in the states and in the federal constitution. The founders knew that the first kind of press and speech to be censored by those in power would be criticism of those in power. We don’t want censorship. But is there something else we could do about the continual bombardment of political advertising for weeks on end? Yes. Let’s thank God we live in a country where this situation is something to complain about. Let’s cast our minds back to the American Revolution. 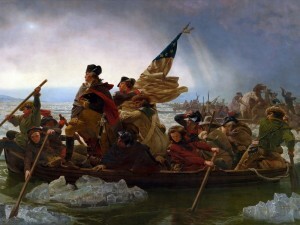 Think of Washington’s famous (and desperate) crossing of the Delaware River for a surprise Christmas assault on Trenton. His soldiers – many of them shoeless – recalled afterwards that they could see blood left in the footprints of their brothers in arms. Let’s cast our minds back to the Civil War. In some battles, thousands of men were killed or wounded in the few minutes it took for the air to be clouded with gunpowder smoke. Let’s cast our minds back to World Wars I and II. Tens of thousands of American soldiers were shipped to the farthest reaches, to die and be buried where no relatives or friends might ever come. And we complain because we’ve seen a few political advertisements more times than we’d like. In this month of remembrance, this month of All Saints’ Day and All Souls’ Day, let us pray in praise and petition for those who have gone before us. And let us hope that those who gave their lives so we could have the freedoms we enjoy are not ashamed of what we their descendants have become – many of us all-too self-centered, superficial, comfortable, and ungrateful. All holy men and women, saints of God, pray for us. And may the souls of all the faithful departed, through the mercy of God, rest in peace. Amen. Thanks very much for this brilliant and inspiring article. It is a reminder for all of us in the free world. 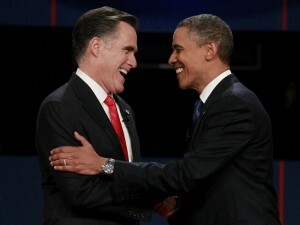 Neither Obama or Romney are evil. They have put themselves up for election. Let the people decide. PS: The result of the election will be great. There will be an Irish-American Catholic VP. the people with hedonistic diversions.